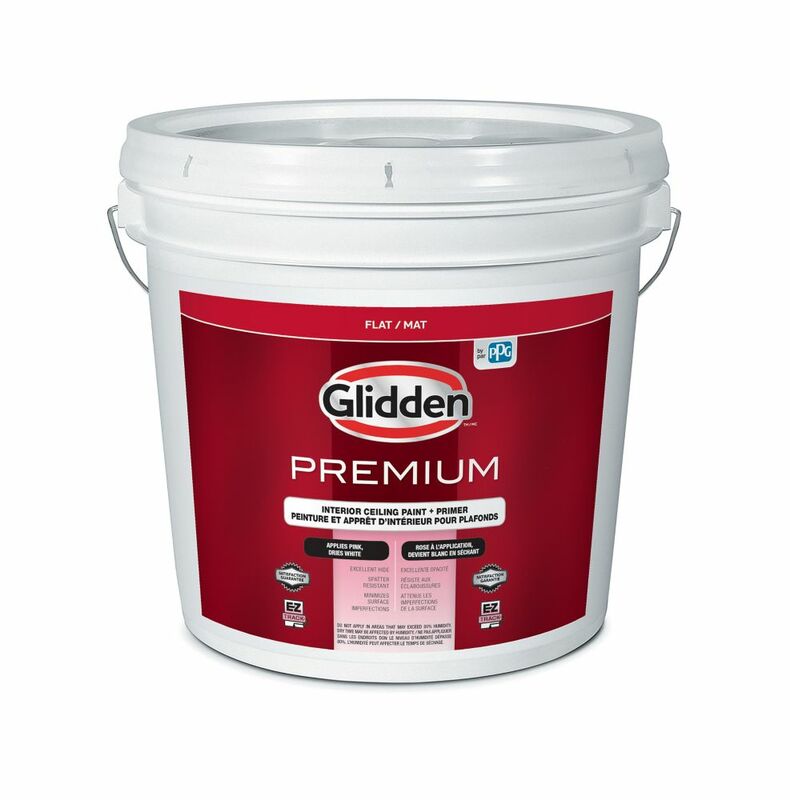 Premium EZ Track Pink To White Ceiling Paint + Primer 7.57 L Glidden Premium Pink to White Ceiling Paint + Primer delivers quality performance at a great price. Our never miss a spot formula makes sure you know where you've been and where you are going. This paint has minimal spatter and great hiding power. For more than 140-years, painters have trusted Glidden and Glidden paints to help them turn inspiration into action to add colour to their lives and Glidden Premium Pink to White Ceiling Paint delivers on this tradition with an exceptional value so you never miss a spot. Premium EZ Track Pink To White Ceiling Paint + Primer 7.57 L is rated 2.7 out of 5 by 3. Rated 5 out of 5 by TERRY from Did the job Used this product to paint a 20 year textured ceiling. Used a 1 inch nap roller. Covered in one coat. Did a similar ceiling with a competitors paint and it took 3 coats. Only negative is the tint fades a bit too fast. Would definitely use again. Rated 2 out of 5 by BohemainRoamers from Very Poor Tint Purchased this paint to do main floor ceiling. It took 3 times as much as they said it should and the tint is almost non-existant. We really could not see were we were painting. After a lot of extra work and time it did come out looking OK but I would not recommend if you are wanting a paint that has a tint. Rated 1 out of 5 by Kelly69 from Does not cover even after 3 coats Does not cover, very disappointed. I've used this product in the past prior to the Smart 3 version with no issues. Something has changed and I'm extremely upset that will now have to buy another brand of paint and redo the ceiling.